No updates for a few days - computer problems! 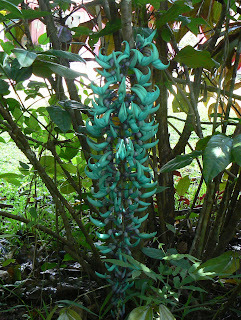 This beautiful vine is a native of the Philippines and is very slow to produce flowers. We planted it about 7 years ago - last year it flowered for the first time but each year so far only two bracts of flowers. This one is about 60cm or 2ft long. Now for an update on our nesting Double-eyed Fig-Parrots. A few of days ago I took this other shot of the male while he was again feeding his mate as she sat on her eggs - she makes a 'chirring' noise when she's demanding to be fed. She had been in there for about three weeks! Then yesterday afternoon we heard a slightly different sound and when we went out to look saw both male and female taking turns to fly up and feed the chicks. Unfortunately the camera wasn't handy but I hope to get a shot of the female outside (she has the pale cheeks whereas the male has red ones). Australia has three species of Double-eyed Fig-Parrots and these are race macleayana and they range from Cooktown to the north of us down to around Mackay. Looking out onto the lawn a couple of days ago there was this little Swamp Wallaby feeding on dropped fruit - and she very obviously has a fairly large joey in her pouch. 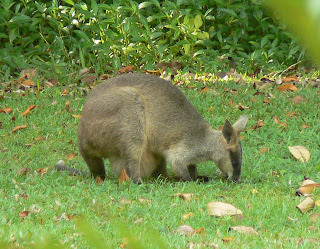 These Wallabies are about 3ft tall, much smaller than most of Australia's Kangaroos. No Kangaroos in Daintree - they are mostly found in the dryer inland parts of the country. 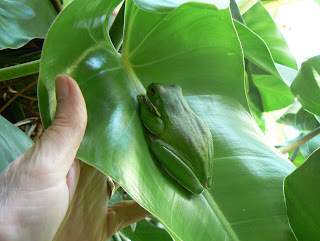 I found this lovely Giant White-lipped Green Tree-Frog asleep on a leaf while gardening the other day. It's quite a large one although they can grow up to about 14 cm (5.5 inches). They also have a very loud croak, especially if one gets into an 'echo-ey' drainpipe! A little more rain over the past few days has really freshened things up and started the grass growing again, but not enough to add much water to the dam. 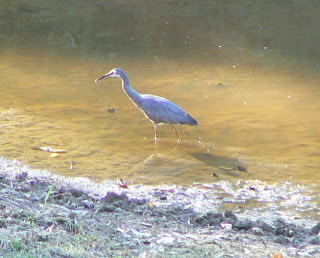 This White-Faced Heron has been here every day 'fishing' in the shallow water, often joined by a variety of Egrets, a Spoonbill and a pair of Little Cormorants. Today is a picture-perfect Far North Queensland day with brilliant blue skies and a forecast maximum temperature of 29 deg C.
At last we have had a little useful rain to help keep the gardens green - 15 mm last night, or just over half an inch. Unfortunately it hasn't helped to refill the dam which is now getting very low - but it will very quickly fill up again when the rainy season arrives in a few months' time. The Malay Apples are now ripe, although they are quite small this season. They are, as the name suggests, a native of SE Asia and look quite attractive on our guests' breakfast trays with their thin red skin and soft white flesh. Not very much flavour but quite pleasant eaten with other fruits. 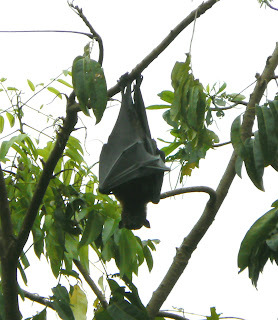 Unfortunately the Spectacled Flying Foxes have also found them and are attacking and eating them every night! We've picked quite a few but they do not keep for more than a couple of days. 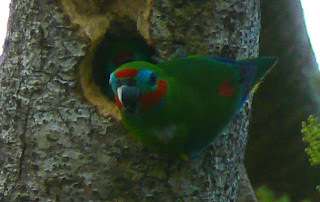 We were delighted yesterday to find a pair of Double-Eyed Fig-Parrots nesting in a hole in a fruit-tree just outside the office. The nest is about 6 metres up the tree and they have dug a hole (looks as if it's their third attempt!) in one of the decaying branches. The female is sitting on the eggs and is visited from time to time by the male (below). They are such beautiful little birds - only about 15cm - and often very hard to spot as they blend in so well to the foliage. Elkhorn Ferns are a common sight in our rainforests and I took this photo yesterday when I went for a walk at the back of our property. It measures about 4-5 ft across and I guess could be possibly 10-15 years old. 1st September and it's the first day of our spring and this tiny female Yellow-bellied Sunbird (photo taken this morning) is furiously building her nest at the front of the old shed. It's really amazing how fast they construct these nests, usually suspended from the flimsiest strands of vegetation, in this case a small piece of dead vine. Just then Claude, the Spotted Tree Monitor mentioned before, came out to watch her (he's just above her and to the left) so we really hope he is not eyeing up a meal! Hopefully she is well out of his reach!